On a beautiful Sunday morning, ANdAL pAtti sits in the pyol (thiNNai – veranda) outside her house and makes garland for perumAL. vyAsa and parAsara come and sit on the pyol next to ANdAL pAtti . They both watch ANdAL pAtti curiously. 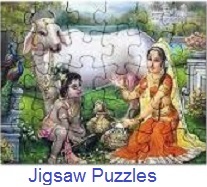 vyAsa: What are you doing pAtti? ANdAL pAtti: Making a garland for perumAL, that reminds me of a couple of AzhwArs? Would you like to hear about one of them now? parAsara: Oh sure pAtti. We are eagerly waiting for that. ANdAL pAtti: That’s like my boy. Then let me tell you about periyAzhwAr. He was born in Ani month swAthi nakshathram in srIvillipuththUr. He was also called as pattarpirAn. He used to make garlands for vatapathrasAyi emperumAn. One fine day, the king who ruled the pAndiyan kingdom, threw open a challenge to the scholars. He announced that he will award a bag full of gold coins to anyone who could establish who is the supreme god. vyAsa: That would have been very difficult, isn’t it pAtti? ANdAL pAtti: It wasn’t so for periyAzhwAr. Due to his bhakthi and the mercy of perumAL, he went to the king’s court and established that perumAL is the almighty through vEdham. The king was so happy that he gave periyAzhwAr the prize money and sent him through the streets of Madurai on a royal elephant. parAsara : That would have been a sight to watch, pAtti. ANdAL pAtti: Yes parAsara, that was. And that is why perumAL himself came down from paramapadham riding his garuda. Even though periyAzhwAr was riding on top of an elephant, he was ever so humble and was worried about the safety of perumAL. So he sang thiruppallANdu to ensure perumAL is protected. That’s how he came to be known as periyAzhwAr. He also sang periyAzhwAr thirumozhi. vyAsa: Oh. Yes pAtti – pallANdu pallANdu sounds familiar. That is what is recited everyday in the beginning. We have heard it in the temple. ANdAL pAtti. Yes, you are right vyAsa. periyAzhwAr‘s thiruppallANdu is always recited in the beginning and the end too. parAsara: That’s nice pAtti. We will also learn it and start reciting it in front of perumAL. ANdAL pAtti: I’m sure, you will start doing that very soon. By the way, he was also the father of ANdAL, the one who sang the most popular thiruppAvai. Will tell you more about ANdAL later, come let’s go and offer the garland to perumAL. ANdAL pAtti finishes making the garland and starts towards srI ranganAthan temple along with vyAsa and parAsara to offer it to perumAL. This entry was posted in Beginner's guide, Stories on November 24, 2014 by Sarathy Thothathri. vyAsa and parAsara goes to ANdAL pAtti and ask her to continue with the AzhwAr stories. ANdAL pAtti: vyAsa and parAsara! Today I am going to tell you about a king who is an AzhwAr. vyAsa: Who is that pAtti? What is his name? when and where was he born? What are his special qualities? ANdAL pAtti: His name is kulasEkara AzhwAr. He was born on mAsi month punarpUsam nakshathram in thiruvanjikkaLam which is located in kEraLa. He was born in a kshathriya family. parAsara: What does kshathriya mean pAtti? ANdAL pAtti: kshathriya means administrators generally, like king, emperor, etc. They rule the kingdom, protect the citizens, etc. vyAsa: Oh, just like our rangarAja, who rules us and protects us in srIrangam. ANdAL pAtti: Yes. Our perumAL is the king for everyone. But each region is ruled by a king and these kings are greatly respected by the local people. Coming back to the history, As he was born in kshathriya family, he was feeling that he was the controller, fully independent, etc. But by the grace of srIman nArAyaNan, he became fully realized that he was fully dependent on perumAL and developed great taste to listening to the glories of perumAL and also taking care of the devotees of perumAL. parAsara: pAtti, I remember you telling that we should be like madhurakavi AzhwAr in serving devotees of perumAL. Was he like that pAtti? ANdAL pAtti: Very nice parAsara. Yes. kulasEkarAzhwAr had great attachment to srI rAmAyaNam. See, in our sampradhAyam “srI rAma” is lovingly called as “perumAL“. Due to kulasEkarAzhwAr’s great attachment towards srI ramAyaNam and srI rAma, he himself becomes to be called as “kulasEkara perumAL”. He would listen to srI rAmAyaNam every day from great scholars and be immersed in the incidents. Once, when he heard that srI rAma was attacked by 14000 rAkshasas, he became disturbed very much and called out for his army to go and assist srI rAma. The devotees of perumAL would then pacify him and tell him that srI rAma had already defeated the rAkshasas single handedly. vyAsa: How did he rule the kingdom pAtti if he was fully engaged in hearing about perumAL? ANdAL pAtti: Yes. That is a very good question. He was unable to focus on the kingdom. His ministers planned to eliminate his attachment towards bhAgavathas who are devotees of perumAL. They stole the necklace of perumAL from his temple in the palace and told him that it was stolen by the bhAgavathas. He did not believe the words of the ministers. It was an ancient practice of proving ones words by putting their hand in a pot which has snake in it. One must be very confident on truth and brave to do this. He asked them to bring a pot which has snake inside it. 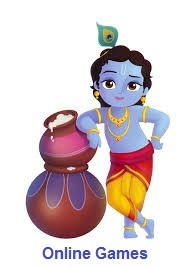 He boldly put his hand inside the pot and proclaimed that the bhAgavathas are innocent. parAsara: That is very nice pAtti. ANdAL pAtti: Yes, also, just like srI rAma had great attachment to periya perumAL (srI ranganAtha), kulasEkara AzhwAr was also greatly attached to periya perumAL and srIrangam. vyAsa: What is the relationship with srI rAma and periya perumAL pAtti? 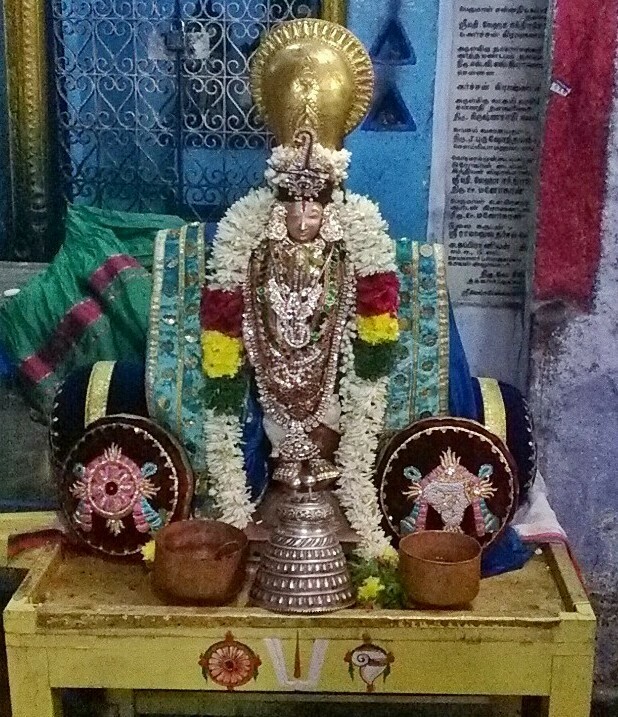 ANdAL pAtti: periya perumAL was the thiruvArAdhana perumAL of srI rAma in ayOdhya. thiruvArAdhana perumAL means the perumAL whom we worship at home. So, in his palace, srI rAma worshipped periya perumAL. But he gave that perumaL as a gift to vibhIshaNa who is his dear devotee. When vibhIshaNa was carrying periya perumAL to lankA, he stopped at srIrangam to perform sandhyA vandhanam. After his sandhyA vandhanam, when he wanted to continue his journey to lankA, periya perumAL said to vibhIshaNa that he liked this place so much and just wanted to stay here facing south side where lankA is. vibhIshaNa agreed to periya perumAL and left to lankA without him. Thus, periya perumAL arrived at srIrangam and continues to stay here till now. parAsara: Oh! Very nice to hear this pAtti. We did not know this connection between perumAL (srI rAma) and periya perumAL before. ANdAL pAtti: So, kulasEkara AzhwAr also had great attachment towards srIrangam and periya perumAL. He wanted to visit srIrangam everyday from his kingdom and would leave from there. But his ministers would stop him by giving some reason or the other so that he can continue to rule the kingdom from there. Eventually, he gave up his kingdom and reaches srIrangam. He sings perumAL thirumozhi in glorification of emperumAn and stays in srIrangam for some time. Finally, he leaves from this world and reaches paramapadham to serve him permanently. vyAsa: pAtti, the more we hear about AzhwArs, the more we know about perumAL since their lives are fully focussed on perumAL. ANdAL pAtti: Yes. We should also focus our lives towards perumAL and his devotees. Now, let us go to kulasEkara AzhwAr sannidhi and have his dharsan. vyAsa and parAsara: Sure pAtti. Let us go now. This entry was posted in Beginner's guide, Stories on November 17, 2014 by Sarathy Thothathri. ANdAL pAtti is in the process of explaining the life of AzhwArs to vyAsa and parAsara. vyAsa: pAtti, we have now heard about mudhalAzhwArgaL and thirumazhisai AzhwAr. Who is next pAtti? ANdAL pAtti: I will tell you about nammAzhwAr who is considered as the chief among AzhwArs. I will also tell a little about his dear sishya madhurakavi AzhwAr. parAsara: Sure pAtti. We are looking forward to hearing about them from you. ANdAL pAtti: nammAzhwAr means “our AzhwAr” in thamizh. He was honored by perumAL himself with this title. 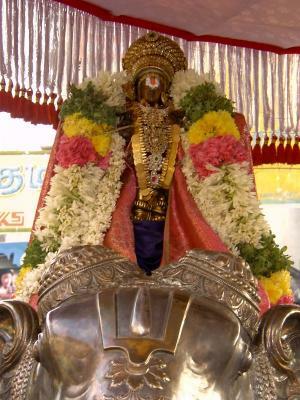 nammAzhwAr was born in AzhwAr thirunagari on vaikAsi month visAka nakshathram. He was born as the son of the local king/administrator named kAri and his wife udaiyanangai. kAri and udaiyanangai did not have any children for a long time. So they went and prayed to thirukkuRungudi nambi for a child. nambi blesses them that he himself will appear as their child. kAri and udaiyanangai returns to AzhwAr thirunagari and soon udayanangai gives birth to a beautiful child. 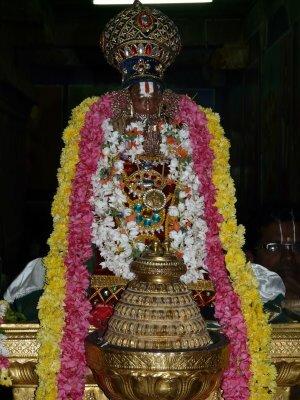 He is hailed as an amsam of perumAL himself and as an amsam of vishwaksEnar at times. vyAsa: Oh! very nice. So, is he perumAL himself? ANdAL pAtti: Looking at his glories, surely we can say that. But as explained by our AchAryas, he himself proclaims that he was one of the jIvAthmAs wandering in this world since time-immemorial and was divinely blessed by srIman nArAyaNan out of his unconditional grace. So, we accept that he is some one who was specially blessed by perumAL. 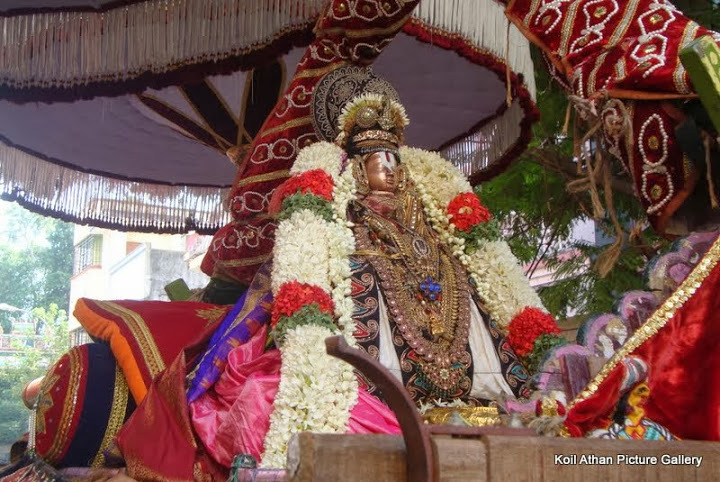 parAsara: Yes pAtti, I remember you saying in the beginning that perumAL blesses certain persons with full knowledge and make them AzhwArs so that they will bring many of us towards perumAL. ANdAL pAtti: Very true parAsara. It is so wonderful that you both remember these important points nicely. So, getting back to nammAzhwAr‘s birth, though he was born like a normal child, he did not eat, cry or do anything. His parents were initially worried and they brought him on the 12th day to Adhi nAtha perumAL temple and placed him in front of perumAL. Due to his distinctive nature from other babies, he was given the name mARan (one who is different). 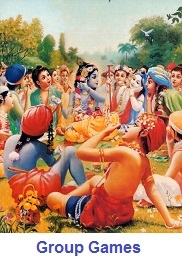 Seeing his unique nature, his parents considered him as a divine personality and placed him under the divine tamarind tree which is located at the south side of the temple and worshiped him with great respect. Since then he stayed for 16 years without speaking a word under the tamarind tree. vyAsa: So, what was he doing all the time? And did he ever speak finally? ANdAL pAtti: Being blessed at the time of birth, he was in deep meditation on perumAL throughout the time. Finally, it was the arrival of madhurakavi AzhwAr which made him speak. parAsara: Who was madhurakavi AzhwAr? What did he do? ANdAL pAtti: madhurakavi AzhwAr was born in thirukkOLUr on chithrai month chithrai nakshathram. He was a great scholar and devotee of srIman nArAyaNan. He was much older than nammAzhwAr and he was on a pilgrimage in ayOdhyA. He had already heard about mARan’s life. At that time, he notices a shining light from the south side and he follows that light which finally leads him all the way to AzhwAr thirunagari temple where mARan is staying. vyAsa: Did nammAzhwAr speak to madhurakavi AzhwAr? ANdAL pAtti: Yes, he did. madhurakavi AzhwAr engages him in a divine conversation and AzhwAr finally speaks. Understanding his glories, madhurakavi AzhwAr at once becomes his sishya and learns all the essential principles that are to be learnt. He also fully serves nammAzhwAr and takes care of him for the rest of his life. parAsara: Oh, that is nice. So, it seems that age is not a criteria when it comes to learning the true knowledge. Here, even though madhurakavi AzhwAr was older than nammAzhwAr, he learnt these principles from nammAzhwAr. ANdAL pAtti: Very good observation parAsara. Yes, one has to be humble to learn from any learned person even if the person is younger than him. That is the true quality of srIvaishNavas and is nicely demonstrated by madhurakavi AzhwAr here. After some years, at the age of 32, nammAzhwAr decides to ascend to paramapadham as he was unable to bear the separation from perumAL any longer. After singing the glories of perumAL in his four prabandhams namely thiruviruththam, thiruvAsiriyam, periya thiruvanthAdhi and thiruvAimozhi, by the grace of perumAL he ascends to paramapadham to be engaged in eternal kainkaryam to perumAL there. vyAsa: That was too young to go to paramapadham pAtti. ANdAL pAtti: Yes. But he wanted to be blissful eternally. And perumAL wanted him to be there. So, he left this world and reached there. madhurakavi AzhwAr then established the archA vigraham of nammAzhwAr which was received by boiling the water of river and arranged for proper worship of nammAzhwAr in this dhivya dhEsam. He composed a prabandham named “kaNNinuN chiRu thAmbu” in full glorification of nammAzhwAr. He also spread the glories of nammAzhwAr every where and established nammAzhwAr‘s greatness all over the region. parAsara: So, it is because of madhurakavi AzhwAr we fully understand nammAzhwAr‘s glories. ANdAL pAtti: Yes. He was totally dedicated to nammAzhwAr and he himself was glorified due to his dedication to nammAzhwAr. See, devotees of perumAL are more glorified than perumAL himself. So, glorification of devotees of perumAL is considered much greater than glorifying perumAL. We too should try to serve the devotees of perumAL whenever possible. vyAsa and parAsara: Surely pAtti. We will keep that mind and look forward to such opportunities. ANdAL pAtti: With this we have seen the life of nammAzhwAr and madhurakavi AzhwAr. Let us go to nammAzhwAr‘s sannidhi and worship him. This entry was posted in Beginner's guide, Stories on November 16, 2014 by Sarathy Thothathri. ANdAL pAtti takes parAsara and vyAsa to thiruveLLaRai temple. They board a bus outside srIrangam rAja gOpuram. parAsara: pAtti, while we are in the bus, can you tell us about the fourth AzhwAr? ANdAL pAtti: Sure, parAsara. I am happy to know that you prefer to speak about AzhwArs during the journey. parAsara and vyAsa smile at pAtti. The bus starts from srIrangam. 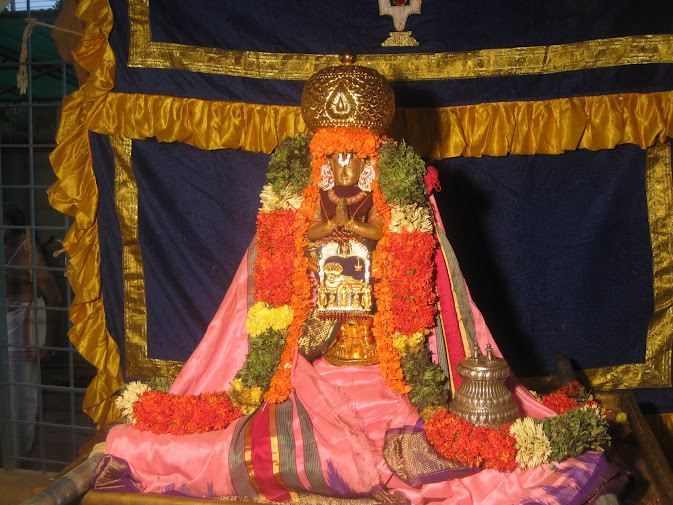 ANdAL PAtti: The fourth AzhwAr is thirumazhisai AzhwAr, he was fondly called as bhaktisAra. He was born on thai month magam nakshathram in thirumazhisai near chennai to bhArgava muni and kanakAngi. He was the AzhwAr who lived the longest in this world. He lived for almost 4700 years. parAsara and vyAsa drop their jaw in astonishment and ask ”4700 years!!!”. ANdAL pAtti: Yes, He traversed through most of the different philosophies before he met pEyAzhwAr. vyAsa: Oh! What happened after they met? ANdAL pAtti: pEyAzhwAr taught him about perumAL in detail and brought thirumazhisai AzhwAr into srivaishNavam. The bus reached chathram bus stand. ANdAL pAtti: He had particular interest in knowing about antharyami, the perumAL who exists within us and he was deeply devoted to kumbakONam Aravamudhan, so much so that perumAL exchanged his name with AzhwAr and they came to be known as ArAvamudhAzhwAr and thirumazhisai pirAn. parAsara: Wow, pAtti. Looks like he had been very close to perumAL. ANdAL pAtti: Yes, he had been. Once in a village, when he was traveling, he visited the temple in that village. The perumAL was so fond of him, he started turning towards whichever direction AzhwAr was moving. Similarly, ArAvamudhan emperumAn was so fond that he listened to him politely and started to get up from his reclining posture when AzhwAr asked him to do that. parAsara and vyAsa eyes pop out in astonishment and ask “What happened then pAtti?”. ANdAL pAtti: AzhwAr got shocked and requested perumAL to get back to his reclining position. perumAL was in double-mind and so he is still in half reclining position. vyAsa: Oh! that is very nice pAtti. One day we should go and visit this perumAL. ANdAL pAtti: Surely, we will go some time there. He stays there for a long time. He throws all of his works into Cauvery river and retains the only 2 prabandhams – thiruchchantha viruththam and nAnmugan thiruvanthAdhi. After that he finally ascends to paramapadham and continues to serve emperumAn in paramapadham eternally. The bus reaches thiruveLLaRai. They enter the temple and have the dharsan of thAyAr and perumAL. This entry was posted in Beginner's guide, Stories on November 15, 2014 by Sarathy Thothathri. ANdAL pAtti, vyAsa and parAsara come out of mudhalAzhwArgaL sannidhi. parAsara: pAtti, it was nice to have the dharsan of mudhalAzhwArgaL . Are these 3 AzhwArs always together pAtti? ANdAL pAtti: Good question. There is a reason for them being together. Let me explain. One fine day, by the divine plan of perumAL, they arrived at thirukkOvalUr one after another. It was a stormy day. There was heavy rains. There was a rishi named mrukaNdu who had an Ashram in thirukkOvalUr. In the front of his Ashram, there was a small shed. First poigai AzhwAr arrived and took shelter of the shed to protect himself from the rain. He lied down there and relaxed for a bit. parAsara: All alone? Wont he be scared? ANdAL pAtti: No parAsara! He wont be scared since he is always thinking of perumAL. At that time, bhUthaththAzhwAr arrives there in the rain and requests permission to enter the shed. poigai AzhwAr says “There is limited space here. One person can lie down but two persons can sit. So, please come in.”. bhUthaththAzhwAr happily enters and they both sit next to each other. Soon after, pEyAzhwAr comes running in the rain wanting to take shelter and he asks permission to enter the shed. poigai AzhwAr says “Well, there is limited space here. One person can lie down, two persons can sit and three persons can stand. So, please come in, we can all stand.”. Hearing that pEyAzhwAr, happily enters the place and they all stand shivering in the cold. They start speaking to each other, get to know about each other and being very joyed about the common interest, they start discussing about perumAL‘s beautiful names, forms, qualities, etc. vyAsa: Wow! That is very nice. Divine indeed. But pAtti, it would be nice, if perumAL too was present there, just like he is here as periya perumAL to see us. ANdAL pAtti: Wait, the incident does not end here. You have very nicely guessed the next sequence. There is more divinity on the way. Seeing the assembly of his dear devotees, now perumAL wants to be part of this too. So, he too enters the shed and squeezes himself in the space. Being dark and suddenly squeezed for space, the three AzhwArs start wondering what is going on and who entered the place without their knowledge. So, first poigai AzhwAr starts singing “vaiyam thagaLiyA” – imagining the world itself as a lamp. Then, bhUthaththAzhwAr sings “anbE thagaLiyA” – imagining his love itself as a lamp. With these lamps, the place becomes lit brightly, and pEyAzhwAr first sees the divine form of srIman nArAyaNan with his divine consort srI mahAlakshmi in the shed amidst them. 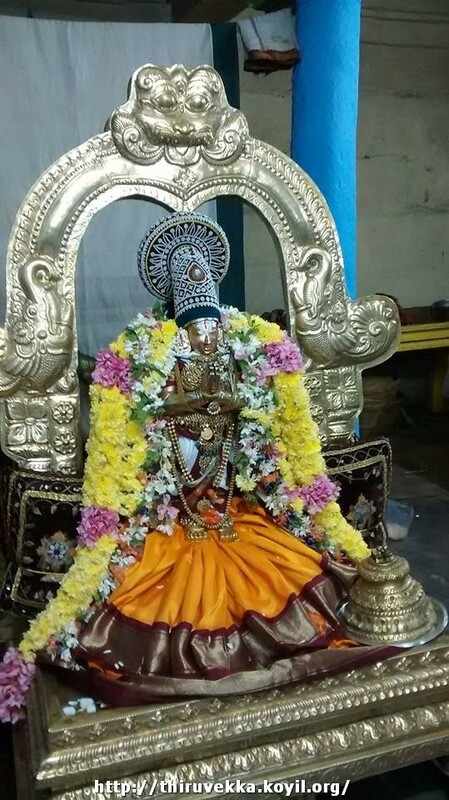 He starts singing “thirukkaNdEn …” (I have had the divine vision of srIman nArAyaNan with srI mahAlakshmi, his divine/beautiful golden form, his divine conch and disc). 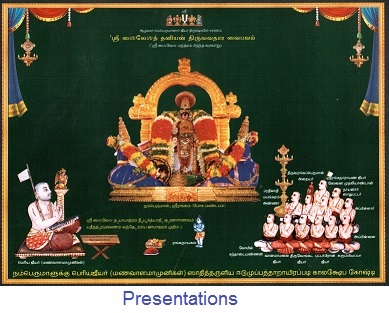 All AzhwArs together enjoy the divine vision of perumAL and thAyAr. parAsara: This is so great. They must have felt so happy. ANdAL pAtti: Yes – they were very happy. perumAL and thAyAr too were very happy. After this wonderful incident, they visited archAvathAra emperumAns in many other temples together. They stayed for the rest of the life together and ascended to paramapadham finally to be with perumAL always and serve him. vyAsa and parAsara: This incident is so amazing to hear. Shall we hear about the next AzhwAr’s life now? ANdAL pAtti: You have to wait until next time for that. Its time for you to play and have some fun outside now while I go and prepare some food for perumAL which we can eat later tonight. vyAsa and parAsara: Sure pAtti. We will come back tomorrow to hear more from you. This entry was posted in Beginner's guide, Stories on November 7, 2014 by Sarathy Thothathri. ANdAL pAtti is planning to take vyAsa and parAsara to mudhalAzhwArgaL sannidhi in srIrangam and explain them their glories. ANdAL pAtti: vyAsa and parAsara! Today we will go to mudhalAzhwArgaL sannidhi in the temple. vyAsa and parAsarA: Great pAtti. Let us go now. ANdAL pAtti: Let me tell a little bit about them while we walk towards their sannidhi. mudhal means first. We already know the meaning of AzhwAr – one who is immersed in devotion. So, mudhalAzhwArgaL are the first amongst the 12 AzhwArs. vyAsa: Why is there a plural in mudhalAzhwArgaL pAtti? Are there more than one “first” AzhwAr? ANdAL pAtti: Ha! Ha! Very nice question. Yes, amongst the AzhwArs, the first 3 AzhwArs are always quoted together. parAsara: Why pAtti? Are they like pancha pANdavas who were always together? ANdAL pAtti: Very nice example parAsara. Yes – though the first 3 AzhwArs were born in 3 different places, through a divine event, they came together and met at thirukkOvalUr dhivya dhEsam and worshipped/enjoyed srIman nArAyaNan together. After that incident, they are generally quoted together. vyAsa: What is that divine event pAtti? I am so curious to know about it. ANdAL pAtti: Surely, I will tell you that incident. But before that, we understand a little about the 3 AzhwArs. 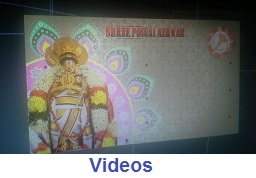 First AzhwAr is named poigai AzhwAr – sarO yOgi. Second AzhwAr is bhUthaththAzhwAr – bhUtha yOgi. Third AzhwAr is known as pEyAzhwAr – mahathAhvaya. parAsara: When and where were they born pAtti? ANdAL pAtti: All 3 of them were born in the previous yuga – dhvApara yuga (the yuga when krishNAvathAram took place). All 3 of them appeared from flowers. poigai AzhwAr was born on aippasi thiruvONam in a pond in thiruvekkA in kAnchIpuram. bhUthaththAzhwAr was born on aippasi avittam in a pond in thirukkadalmallai – now you know this place as mahAbalipuram. pEyAzhwAr was born on aippasi sathayam in a well in thirumayilai – now you know this place as mylApUr. vyAsa: Wow! They were born from flowers. So, dont they have mother and father? ANdAL pAtti: Yes, they were blessed by bhagavAn during their birth itself and they fully considered thAyAr and perumAL as their mother and father. parAsara: Oh, that is wonderful to know. So, how did they meet and what was that divine incident? ANdAL pAtti: Well, they were individually travelling to different kshEthrams and were worshipping bhagavAn in many places. That was their life – just go to a temple, worship perumAL and stay there for a few days and then move on to the next one. vyAsa: That sounds so wonderful – no need to worry about anything else. Wish we could do that too pAtti. ANdAL pAtti: Yes. Look we have arrived at mudhalAzhwArgaL sannidhi. Let us go in and have their dharsan. We will continue with rest of their life on return. This entry was posted in Beginner's guide, Stories on November 6, 2014 by Sarathy Thothathri.